These are three of Edward and Mattie (Dotson) Cleage’s six children. 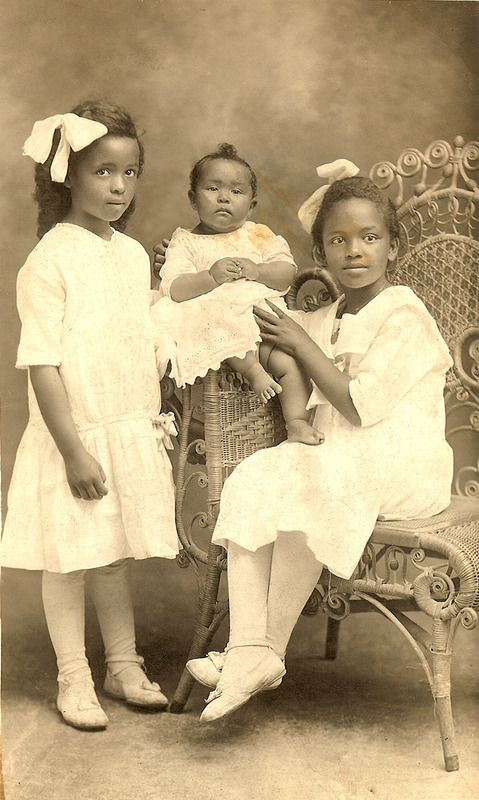 Alberta was born in 1908, baby Ola in December of 1916 and Helen in 1910. There was an older brother, Lawrence, who died at a year old. Two more daughters, Beatrice and Juanita, were born later. Edward was the only child of Lewis and Celia (Rice) Cleage to remain in Athens, Tennessee. His other four siblings moved first to Indianapolis, IN and then to Detroit, MI. Edward suffered from rheumatoid arthritis and died at 46, when his youngest daughter was four years old. For more Sepia Saturday offerings. What gorgeous girls, the little one has cute chubby legs and they are all dressed so beautifully. How sad for the whole family that their father died so young. Those girls are just beautiful! The little one looks so cuddleable. How sad that Edward died at such a young age. This is a precious family shot, with the older one holding the wee one. Just precious, love the bows in the girls' hair.